The debate surrounding Labour’s leadership contest is being marred by name-calling and red-baiting. Perhaps this is inevitable but it is regrettable. Britain remains in an economic crisis, which has now entered its eighth year. A more productive course would be to discuss how to end it. A marker of that crisis is that per capita GDP is still below where it was before the crisis began in 2008, as shown in Fig. 1 below. This remains the weakest recovery on record and the year-on-year growth rate has slowed from 3% to 2.6%. This follows a period from the end of 2012 onwards when no new austerity measures were imposed. Renewed austerity on the same scale as in 2010 to 2012 means there is likely to be a similar slowdown. The Tory strategy is more of the same, which one commentator called a Captain Bligh policy, “the floggings will continue until morale improves”. This policy is supported by virtually all the mainstream press. Unfortunately, it is also supported by 3 of the 4 candidates for Labour’s leadership. They abstained on the Tory Welfare Bill the centrepiece of the government’s latest Budget. Only Jeremy Corbyn stands on a clear anti-austerity platform. His economic policy can be found here (pdf). No-one alive today has ever experienced in a longer economic crisis in Britain. The nearest comparison for the length of the current British economic crisis was at the end of the nineteenth century and the Long Depression. As per capita GDP has not recovered it is extremely difficult for median average living standards to rise. On the contrary, the austerity policy serves to work in the opposite direction by transferring incomes and wealth from poor and middle-income layers to the rich and from labour to big business. So, the latest Budget included a further cut in the Corporation Tax rate to 18% while cutting £12 billion in social protection to the most vulnerable in society. The Tory policy is straightforward. These transfers of income known as austerity will continue until the business sector is making sufficient profits for it to resume investment. The crisis will be paid for by increasing the rate of exploitation. The austerity mark II of the latest Budget is not because there is still a public sector deficit, as this will fall as it does everywhere even if there is moderate nominal GDP growth. Renewed austerity is necessary because business is not yet willing to fund an investment-led recovery. The level of investment in the British economy was £295 billion in 2014, exactly the same as the pre-crisis level of 2007. But the economy is actually larger 4.2% larger (keeping pace with population growth, but no more than that). Therefore investment is declining as a proportion of GDP. Consumption, not investment is leading very weak growth and this is not sustainable. Yet the profit level has also recovered and accounted for 37% of GDP in 2014, compared to 36.1% in 2007. So the Tory policy is not working. 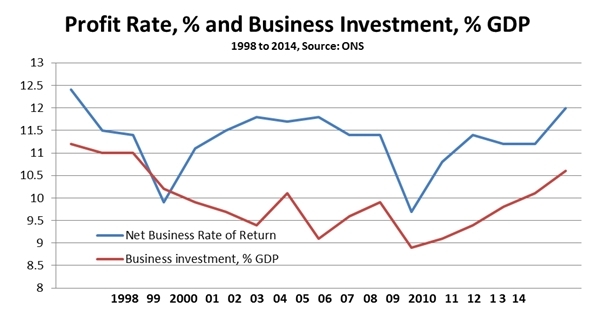 Profits have increased by 6.8% in real terms since 2007, but investment is unchanged. Fig.2 below shows the official estimate of the profit rate in the non-financial sector versus the proportion of GDP devoted to business investment. These are strikingly indifferent results for 5 years of austerity policies. The profit rate has only barely returned to its pre-crisis level and is well below profitability prior to this century. The same is true for business investment. Both of these are a recipe for continued slow growth. The profits recovery has been greater than the investment rebound. As a result, the extremely high level of uninvested profits has actually grown. The level of uninvested profits in the British economy was £355 billion in 2014, compared to £261 billion in 2007. This is the main brake on a robust and sustainable recovery. Andy Haldane, chief economist of the Bank of England says that firms are ‘eating themselves’ by refusing to invest and instead paying out ever-greater proportions of profits in shareholder dividends. This has been a recurring theme in SEB, and we might add the enormous increase in managerial pay and bonuses which are also a factor. The remainder is deposited in the banks, where it fuels ongoing speculation in financial assets, stocks, housing and commodities. Unfortunately, it is this Tory strategy that 3 of the 4 contenders for the Labour leadership have endorsed. They have no principle difference with the centrepiece of Tory strategy, cuts to social protection ‘welfare’, privatisations and cuts to corporation tax. The recovery from crisis will be funded by workers and the poor. This is an extremist economic policy. In the first phase of the leadership campaign it began with an attack on public spending of the Blair and Brown years, placing the candidates not only to the right of New Labour but to the Tories of the time, who effectively endorsed New Labour spending. Economically, it also places those candidates to the right of Thatcher, who both spent and taxed more than New Labour as a proportion of GDP. It is perhaps worth recalling that main rates of taxation were significantly less regressive even when Thatcher left office in 1990 than they are under the current government (and that many of them were made more regressive by New Labour). This wholesale adoption of the key planks of an economic policy of a government to the right of Thatcher has been compounded by the refusal to oppose the Tory policy of cutting £12 billion from the ‘welfare’ bill. This is widely understood as a direct attack on the living standards of the poorest and most vulnerable and will directly increase child poverty. The Institute of Fiscal Studies, which is not a hot-bed or radicalism but simply uses the Treasury’s own model of the distributional impacts of Budgetary measures, was explicit in arguing that the Budget would increase child poverty. Yet these measures were not opposed by the Labour frontbench or by 3 of the 4 candidates for leadership. Even the Blairites used to boast that they had reduced child poverty. It is more than a rhetorical question, but also a vital political one to ask if the Labour Party supports increasing child poverty, what is it for? Jeremy Corbyn is the only candidate who is not proposing extremist economics. His policy aims to promote growth through increased public investment, funded by progressive reform of the current taxation system, and attacking the abuses of the £93 billion in annual payments for ‘corporate welfare’ in subsidies, bribes and incentives to the private sector. At the same time he opposes any attempt to make workers and the poor pay for the crisis and rightly argues that the deficit would close naturally with stronger growth. This poses a different way out of the crisis than the one supported by the Tories and the Labour frontbench. His campaign and platform corresponds to a mood inside the Labour Party and wider society. The Tories only won 24% of the electorate's vote in May because only a minority supports their policy. Labour got fewer votes because it had no alternative. It used to be the case in the period of economic expansion before the crisis, that to some extent ‘a rising tide lifted all boats’. Even if the labour share of national income declined continuously from the 1980s under all governments, at least living standards for the majority in work were rising. That is no longer the case. The entire austerity policy means that there will be no rise in living standards for the majority until big business sees fit to invest once more. That is, only after having made workers and the poor pay for the crisis and a renewed fall in living standards. It is this policy which the Labour Party frontbench has signed up to. It is a shock to many in Labour that the verbal commitment to match Tory spending is a real one, even when that means supporting an increase in child poverty. Many are quite rightly revolted by it. By contrast, Jeremy Corbyn’s economic plan is a moderate, logical and fair one. Big business has the resources to fund the investment the economy needs and as they refuse to invest on a sufficient scale, government will use some of their resources in the interests of society as a whole. Workers and the poor should not pay for a crisis they did not cause. Jeremy Corbyn’s plan for state-led investment offers a way out of the crisis. According to the Financial Times, Donald Tusk, the President of the European Council, played a key role in finalising the negotiations that led to the forcing of the draconian bailout agreement upon the Greek government. In doing so, the former Polish Prime Minister has contributed to the undermining of the principles of democracy and solidarity that are supposed to uphold the European Union. He has also helped to ensure that the European Union moves further away from the very policies that have benefited the Polish economy. Donald Tusk, whilst Polish Prime Minister, regularly referred to Poland as Europe’s Green Island and the country that had most successfully avoided the recessionary effects of the global economic crisis. Political leaders and commentators, both at home and abroad, have praised the country for its achievements and put it down as a success story of neo-liberal reform and a model for emulation by others. Of course this image of Poland is a simplified and in many ways misguided one. The country continues to suffer from high unemployment rates and large pockets of poverty; it has the largest percentage of workers employed on insecure contracts in the whole of the EU; many of its essential public services are crumbling; its industrial base has been largely dismantled and up to two million of its citizens have been forced to emigrate in search of a better life abroad. The fact that Poland can currently be considered a success, says more about the dire state of the European economy than it does about the actual situation in the country. Despite these failings it would be wrong to dismiss the benefits of Poland’s economic growth. The Polish economy has grown by around 22% since the financial crisis in 2008, whilst for example the Greek economy has shrunk by 28% and Spain’s by 5%. So why has the Polish economy enjoyed this relative success? Over the past couple of decade, the Polish economy has only developed when it has at least partially diverted from the course of neo-liberal reform. Furthermore, it is rarely acknowledged that this has only been possible when European and international institutions have provided the room and means for the Polish government to take a more interventionist role in the economy. This has principally taken two forms: firstly the writing off large parts of Poland’s external debt and secondly the transfer of large EU funds to the country. The current economic crisis in the Eurozone is centred upon the attempt to transfer the costs of the European financial crisis onto the people of southern Europe and other periphery economies, through the implementation of extreme programmes of austerity that have already caused a social and economic catastrophe in these countries. However, one wonders whether during discussions between Angela Merkel and Donald Tusk over the current crisis in Greece, they ever reflect on the fact that the only two countries to have had their external debt written off in post-war Europe were in fact Poland and Germany. Poland was able to recover from the sharp economic downturn at the beginning of the transition, when in 1991 it made an agreement with the Paris Club (that represented the main state creditors) to reduce its debt in half and three years later it came to a similar arrangement with the London Club of commercial banks. This provided the room for the Polish economy to grow and in 1996 it became the first economy to return to its pre-transition level of GDP. Poland was able to recover from its second major economic slowdown, after it entered the European Union in 2004. As we can see in the table below, GDP growth peaked at 7.2% in 2007 and although growth slowed again following the outbreak of the international financial crisis, Poland has continued to sustain its course of economic growth. The common explanation given for this was that its previous reforms had created a competitive and dynamic economy that shielded it from the worst effects of the crisis and allowed it to develop even during the most turbulent times in the international economy. As this version of events has largely gone unchallenged, Poland has become neo-liberalism’s symbol of success in Europe. Poland was able to avoid an economic recession due to a unique combination of internal and external factors. Firstly, the country suffered no significant collapse in its banking and financial sectors. Personal debt in Poland remained low and the banking sector relatively well regulated. Secondly, Poland was not as dependent on the inflow of private credit and capital as some other small economies in the region, nor so heavily reliant upon exports. Thirdly, Poland had not joined or tied its currency to the euro and therefore could retain some competitiveness through devaluation. Finally, throughout the crisis, the Polish government continued to increase spending, particularly by raising public investment through utilising the money gained from an inflow of European Union structural and cohesion funds. It is this final point that has been of crucial importance for Poland’s relative success. Poland found itself in the fortunate position of having large structural and cohesion funds flow into the country just as the international economic crisis began. It is worth pausing to consider what these funds actually are. These are funds that are paid by member states into the European Union budget and are distributed primarily to its poorer regions in order to foster economic convergence. Therefore, they are the complete antithesis of neo-liberal economic orthodoxy as they are based on the principles of government spending funded through economic redistribution from the richer to the poorer regions. These funds are inadequately low, with the European Union’s budget only equalling around 1% of the member states’ total GDP. However, they have helped many of the poorest countries and regions of the European Union to invest in their infrastructure and make some important developmental strides. Poland was the single largest recipient of European Union funds from the 2007-13 budget, and was liable to receive up to €67billion in structural and cohesion funds. This helped the government to instigate large investments in the country’s infrastructure, particularly in preparation for the Euro2012 football championships. As a share of overall investment, public investment increased from 35% to 43% between 2005 and 2010 and as a share of GDP from 4.2% to 5.7% from 2007 to 2011. The biggest increase in investment was in the area of buildings and infrastructure, which increased from €1.8billion in 2005 to €3.1billion in 2010. However, as the funds from the first European Union budget began to dry up and the investment surge for Euro2012 came to an end, so economic growth in Poland started to slow, falling from 4.8% in 2011 to 1.8% in 2012 and then 1.7% in 2013. 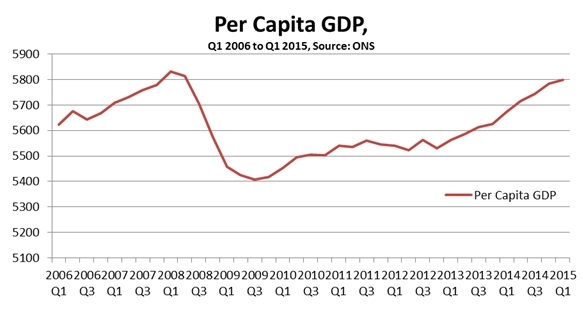 This was caused by a fall in the rate of public investment, which declined from nearly 6 of GDP in 2011 to just over 4% in 2013. Nevertheless this was still significantly higher than the average rate of public investment in the European Union and well above that in countries such as Spain and Greece. Poland’s rate of public investment began to rise again in 2014 as funds from the new European Union budget started to arrive and economic growth rose again above 3%. For the first time in its history the present European Union budget (2014-21) is lower than the previous one. However, Poland uniquely managed to negotiate itself a share of the budget that is higher than that which it had received previously, meaning that it has access to around €500bn (adjusted for inflation), which equals around €1,890 per head, €82 more than that received out of the 2007-13 budget. Despite the continual difficulties in Poland, and the ongoing uncertainty in the European and international economy, this sum should be sufficient for the government to once again increase investment in the economy and sustain a course of positive economic growth. By the end of this decade these funds will begin to dry up and it is unlikely that Poland will receive a similar inflow of money from the European Union again. The danger is that it will then be in a similar position to that which many countries in southern Europe find themselves today. These countries received even higher levels of European Union funds in the 1980s and 1990s, which helped them to develop much of their neglected infrastructure. However, once these funds were diverted eastwards and then the financial crisis hit, so their economies spiralled downwards. If Poland is to avoid a similar fate it has to work out how it will maintain its rate of public investment when the current European Union budget ends. It should start now by arguing for a significantly enlarged future European Union budget and also support restructuring the debt of countries such as Greece to allow them the room, that Poland was previously afforded, to rebuild their economies. Unfortunately the actions of Donald Tusk and other European leaders have served to significantly weaken any remaining principles of solidarity and cohesion in the European Union. This will hit periphery economies like Poland the hardest and strengthen conservative politicians in the richer states that wish to pursue more protectionist policies, close their labour markets and reduce the amount of subsidies and funds transferred to poorer regions. Most media coverage of the Budget is predictably sycophantic and wrong. An objective assessment is that the amount of fiscal tightening planned in this Budget is exactly the same as outlined in the June 2010 Budget. The June 2010 Budget planned tightening of £40bn, but £3bn of this was the projected fall in interest payments. Total austerity measures were £37 billion. This time George Osborne has announced total fiscal tightening of £37 billion, with further details to be added in future Budgets. Therefore the same result should be expected. The British economy is now 14% larger in nominal terms than it was in 2010, but the international economy is growing more slowly. Circumstances are not exactly the same then and now, but the impact of £37 billion in austerity will be broadly the same. If these plans are implemented growth is likely to slow as it did previously. At that time in 2010 the economy was growing at a 2.2% annual rate. The imposition of austerity measures slowed that to just 0.7% in 2012 and the economy only narrowly avoided a rare ‘double-dip’ recession[i]. The stronger growth in 2013 and 2014 arose because there were no new austerity measures in the run-up to the General Election. In that same 2010 Budget Osborne claimed the public sector net borrowing would fall to £37bn in 2014/15, or 2.1% of GDP. The outturn was actually £80 billion and 4.4% of GDP. [ii] In fact the deficit was on a rising trend in 2012 to £111 billion from £92 billion in 2011 as the economy slumped. It only started to fall once new austerity measures were halted and the economy could recover. Austerity did not cut the deficit. Growth did. Austerity is the transfer of incomes from poor to rich and from workers to big business. Social protections (so-called welfare) are cut in order to drive workers to accept ever-lower pay. If people with disabilities can barely subsist, if the sick have subsistence incomes cut, if women have lower pay, increased burdens from worse public services and greater responsibilities as carers, this is regarded only as collateral damage, if at all. In the £37 billion in combined tax increases and spending cuts over this Parliament, only £17 billion of that is specified in the latest Budget. Very large departmental cuts will be announced in the Autumn Statement and future Budgets, totalling £20bn. £12 billion of that £17 billion will come from cuts to social security protection, and another £5 billion is said to come from clampdown on tax evasion. The claim that any of this has as its primary aim deficit reduction is belied by the cut in Corporation Tax to 18%. Even before this cut, businesses paid a token amount of total taxation. In the current year corporate tax receipts are expected to be £42 billion. This compares to a total £331 billion paid in income tax, VAT and council tax. There is also a host of benefits to companies and the rich including more measures on Help to Buy, and rent a room relief to add fuel to the house price bubble. The Inheritance Tax threshold is raised to £½ million per person, up to £1 million per family on homes. Shareholders can receive £5,000 in dividend payments tax-free. Along with other changes, rich savers can now receive £17,500 a year tax-free. There is an increase in tax-free personal allowances and the main beneficiaries of all such measures are high taxpayers. For the poorest, there are only ‘welfare cuts’. After 2017 there will be no additional tax credits, Universal Credit or housing benefit for families with more than two kids. New applications to Employment Support Allowance will be curbed, which is for people who are not fit to work. A string of further cuts to entitlements will only emerge slowly. The Financial Times has already shown that cuts to tax credits will hit ethnic minority communities hardest. Osborne also announced a National Living Wage amid much excitement from the Tory press and the BBC. It is entirely fake. The current National Minimum Wage is not enforced and the TUC estimates 350,000 workers are paid below it, alongside an army of people in forced ‘self-employment’. The actual Living Wage is estimated objectively, and includes the tax credits that Osborne has slashed. Insultingly, the main beneficiaries of the Tory plan are actually businesses, who have had Corporation Tax and employers’ National Insurance Contributions cut by a greater amount to ‘pay for’ it. Public sector pay rises will be capped at 1%. This is below the level of inflation projected by the Office for Budget Responsibility in every year from 2016 through to 2020. This is another large real cut in public sector pay. The target is not solely public sector workers, as there is what is known as a ‘demonstration effect’ where depressing public sector pay also holds back private sector pay. This seems to have operated strongly for most of the last parliament. Politically, it is a deeply reactionary Budget. There is a real-terms increase in military budget every year and a commitment to spending 2% of GDP. This stands in contrast to the NHS, education budgets and so on. The Tory claim is that these are ‘protected’ when in fact they are frozen. As there is still inflation and the population is growing, this ‘protection’ amounts to large real per capita cuts. At the same time, Osborne signalled a large shift towards road building and continued the move away from renewable energy. It is the opposite of Green budget. There will be a strongly regressive regional effect. Areas where there is a higher level of social protections payments, poorer areas and those with a higher proportion of public sector jobs will all be hit harder. The City of London and the South East outside London will be the beneficiaries. Scotland and Wales are threatened with the Tory version of fiscal devolution; taking responsibility for Tory cuts and the power only to make further cuts. The Irish are not even trusted that far. The intention is to try to impose the Tory version of the Stormont House Agreement, which is not what was agreed. The Tory version is a raft of cuts which would further entrench the British mismanagement of the Irish economy. The experience of 2013 and 2014 compared to the previous years of the last Government shows that growth is the key to reducing the deficit, not austerity. As the economy slowed in 2012 the deficit rose from £92 billion to £111 billion. When austerity was halted, the economy experienced a mild recovery and the deficit fell to £88 billion. Austerity doesn’t close the deficit; growth does. The government should be investing in developing the economy and in public services for growth, which would reduce the deficit. Rather than cutting taxes, business levies should be increased in order to finance the necessary investment in renewable energy, rail transport and ports, housing, infrastructure and education. Instead, public sector net investment will be cut every year in this parliament. The projected level of £30.4 billion in FY 2019/20 will be just 1.3% of GDP, compared to 3.5% in 2009/10. We also learn that ‘corporate welfare’ amounts to £93bn a year, which is greater than the £88 billion of the deficit[iv]. This could be cut, rather than social protection entitlements to the most vulnerable. The tax system is hugely regressive. It could be reformed to allow those best able to pay the burden of the crisis to do so. Tax breaks on pensions for those earning over £150,000 could be eliminated. The top tax rate of 50p could be restored at the same level. The 10% rate on Capital Gains Tax should be increased to the basic rate income tax, to ‘make work pay’. Corporate tax relief on both losses carried forward to future years and back to previous years is unique to Britain. Most countries allow one or the other, but not both, and one should be scrapped. ‘Non-domicile’ tax status applies to 115,000 residents, who are overwhelmingly the super-rich, oligarchs, etc. Their status should be ended, not just tinkered with as Osborne has done, so that if they want to live and work here they should pay taxes at the normal rate. These funds could be used to finance public investment, along with levies on business. There is also hugely wasteful spending. Defence spending is the only area where spending is fixed as a proportion of GDP, and has no economic benefit. Trident will also cost £100bn over its lifetime, which is a non-independent nuclear deterrent and could only be used in a worldwide nuclear conflagration. There are a myriad of alternatives. What is required is the political will to elaborate and champion them. The attack on ‘welfare’ comes first because there so little opposition to these cuts, certainly none from the Labour front bench. Yet all Chancellors are political and this one intensely so. The pace of austerity has been slowed compared to the March Budget (which successfully induced Labour to sign up to wholly unrealistic spending plans). The small tax increases in the latest Budget do not fall on workers or the poor. This reflects Tory political weakness, as they felt unable to. This government has less support than Thatcher while it is trying to carry out a more radical programme. Opposition to austerity both inside and outside parliament can change Tory plans. They already changed once after all, in 2012. The Tories have radically reactionary plans, but they can be prevented from implementing them. George Osborne will cast his latest ‘emergency Budget’ in terms of the imperative to reduce the deficit. This is of course nonsense. The Chancellor has cut the corporate tax rate from 28% to 20% and cut income taxes for high earners while slashing public services, social protection payments, public sector pay and jobs. This is a transfer of incomes from poor to rich and from workers to big business. Like its policy predecessors (monetarism, shadowing the Deutschemark, membership of the Exchange Rate Mechanism, and so on) deficit-reduction is simply a cloak for policies aimed at reducing wages and the social wage in order to boost profits. The claim for deficit reduction is that ‘we are living beyond our means’. But the target of the austerity policy is the living standards of average households. They are not running a deficit at all. In fact the average household runs a surplus with the government. The average household contributes more revenue to government than it receives. Taking all taxes and all benefits into account, this surplus amounts to £463 per household on average. As there are approximately 26.5 million households in the UK, this means that the household sector ran an aggregate surplus with government of over £12 billion in the most recent year. To be clear these benefits include benefits-in-kind including a monetary value of education, of the NHS, subsidised travel and vouchers for free school meals as well as all forms of social welfare protections. The data is compiled by the Office for National Statistics, and the key summary table is reproduced below. The household sector is not ‘living beyond its means’ and there is no imperative to resume austerity on this score. The welfare burden is anything but; households contribute more in direct and indirect taxes than they receive in benefits. Yet the deficit is real. Part of this is the necessary spending on international aid, policing and other items, but also on wholly unproductive items such as the military budget. But these are not substantial budget items by comparison to pensions, social security, the NHS and so on. As the deficit is real, and the household sector runs a surplus there must be a key sector of the economy that is ‘living beyond its means’, or lazily scrounging off the rest of the society. In Britain that sector is big business. It receives approximately £85 billion a year in what is known as corporate welfare, tax breaks, incentives, subsidies and other transfers. Research from the University of York suggests that the annual bill for corporate welfare in 2011/12 was £85 billion, on a conservative estimate. This includes all the subsidies and grants paid to business, as well as the corporate tax loopholes, subsidised credit, export guarantees and so on. This is the real drain on resources. The subsidies help to preserve inefficient and otherwise unprofitable companies at the expense of both their customers and their efficient competitors. If those companies are performing a necessary function but cannot do so without the subsidies, then they properly belong in the public sector. There is too the question of the deficit which is the ostensible reason for the austerity policy. In the most recent financial year the public sector deficit (excluding the effects of the bank bailout) was £89.2 billion. As corporate welfare has been rising since 2011/12 it is safe to assume it accounts for the entirety of that public sector deficit. It is business, not the poor, people with disabilities, women burdened by increased carer responsibilities or public sector workers who should shoulder the burden of the crisis they created. *Aditya Chakrobortty has provided an excellent update of the latest estimate of 'corporate welfare', which now stands at £93 billion. 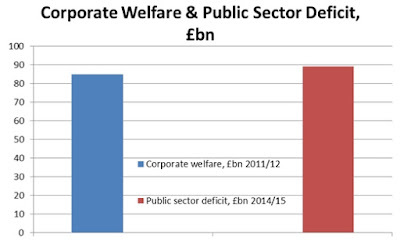 This is greater than the entire public sector deficit in the latest financial year.